The pride of southwestern Spain, Montecastillo Resort has long been a favourite of golfers all over the world. One of Jack Nicklaus’ most magnificent layouts, the course flows over the rolling hills of Andalucia, offering some fantastic views of the Spanish countryside. Often compared to England’s Wentworth, Montecastillo is a historic course. The host of the European Tour’s Volvo Masters from 1997-2001, this epic track has seen many golfing greats tee it up over the years. Found just 15 miles from Spain’s gorgeous Atlantic coast, Montecastillo is in a great location, only 15 minutes from Jerez Airport and 30 minutes from Cadiz. The 5-star Barcelo Hotel at Montecastillo is magnificent, offering the highest standard of comfort and service. The elegant accommodation is decorated in Andalucian fashion, adding to the historic feel of the resort. The facilities at Montecastillo are first class, the resort boasts an extensive spa, swimming pools, sports facilities and choice of restaurants. 1 guest free in groups of 8 or more. Supplements apply for travel dates from the 11th to the 18th of May. Supplements apply for travel dates from the 11th to the 18th May. The course hosted the cream of the European Tour for the end-of-season Volvo Masters from 1997-2001, underlining how good the Golden Bear's layout is. Since then it has received a shot in the arm with a €2 million investment scheme, which included extensive olive tree plantations, a new drainage system and GPS technology. The beauty of Montecastillo is that despite the fact that it hosts prestigious professional tournaments, it remains a manageable proposition for the average golfer thanks to a variety of tees. The internationally renowned course is undoubtedly a highlight of Andalucia's rich golfing portfolio, and in conjunction with the tremendous neighbouring hotel makes for a memorable Spanish golf holiday. Monecastillo's golf course receives more than 3,000 hours of sun every year, helping to explain why it is such a favourite with golfers. Montecastillo's 18th is the perfect closing hole to your round. 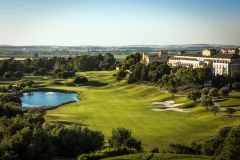 From the 66 yard elevated tee, you are greeted with spectacular panoramic views of the course, and can see Montecastillo lining the right hand side of the hole. Although the fairway is wide, the lake on the left will always leave a lingering worry in your mind as to whether your ball may find itself into the water! Of all its rich produce, Jerez is most famous for its fino and amontillado sherry. Nice 4/5* hotel . Unfortunately despite brilliant sunny weather both outdoor pool areas closed with no sun loungers . Only pool available was small spa pool which cost E15 per swim . No spike bar although lovely sunny terrace to enjoy a coffee or post match beer.Hotel is next to jerez race track so be prepared for noice from motor cycle and race car testing?practice. Overall we had a great trip and the weather was perfect for the golf at 23 deg. We even got a free room upgrade to one of the villa's which was great. Barcelo Monte Castillo was a superb stay for the New Year. Clean,friendly, festive and professionally run. Staff were excellent and the organisation and execution of the gala dinner is to be commended. The hotel was lovely, the buffet menu was really high quality and the breakfast was superb. The hotel standard was excellent and we thought the price was very reasonable too. All in all, we were delighted with the hotel. We have not stayed in this hotel for two years and they have continued to improve the embiance of the hotel and the buffet. It’s popularity and value for money meant that it was full and tee times difficult to book so I would suggest you book early. I enjoy the entire set-up of the resort. The buggy fee is high, and can be windy. My Caddy Tip - "Play conservatively. Par is a good score." All of the holes were quality. Great apart from having only Cruzcampo beer served in silly stubby glasses. My Caddy Tip - "Play it as you see it." All holes were very interesting and enjoyable. If you are of middle H/C would advise playing from blue tees. The hotel was very nice and food was of good standard. Many nice holes and the hotel is just great. The Hotel is top drawer, the staff are wonderful, the service is excellent. The golf course is a very tough test of golf and is not really suitable for anybody who is not a regular golfer, but, for a good golfer it is good. This year maybe due to the weather some of the tees were in poor condition and generally the bunkers were difficult to get out of as they were solid under a thin layer of sand. They have spent a lot of money over the last few years on the hotel and the course and it shows. The hotel was tired, the food was not great and the location was very secluded. Even though we had a hire car, there was nowhere really to go within an hours drive. However, the course itself we enjoyed and at the time of our visit, the greens were being repaired and airiated and what had been removed from greens were actually piled around or even in front of the greens. Hotel was great, as was the food. The staff were very helpful and friendly. My Caddy Tip - "Greens are very slick.Bring your top driving game!" Golf and hotel was first class and and had everthing for a great golf trip. Would go back anytime. Take a camera onto the 18th tee. The hotel is fine. Buffet choice is varied and rooms very comfortable. The course suits all levels of golf and has some interesting holes. Hotel was very good and the food excellent. Expensive buggies! Fantastic golf course suitable for all handicap levels. My Caddy Tip - "Keep straight on the 18th tee." Great but very hilly course. Quality hotel with a testing golf course and a wonderful Spanish Town nearby. My Caddy Tip - "Just stay on the Fairways." All aspects of the break were superb- course, hotel etc. My Caddy Tip - "Trust your club choice maybe even a club more." The 18th was a fantastic hole, with an elevated tee & I loved the beer on the 19th. Nice Hotel. Good breakfast. My Caddy Tip - "Trust your club choice and maybe even take a club more." The 18th has to be the best but most testing hole of the course, water all down left side after an elevated tee shot and the mens tee is almost in the clouds. Very small green so approach shot needs to be accurate. My Caddy Tip - "Always take one club more!" 18th hole is great. Hotel & facilities are good. It's a couple of miles out of Jerez motor circuit. Favourite hole was the 1st in the morning mist, right after an awesome breakfast. Ending hole 18 gives spectacular views. And cerveca is right on the money after the course! My Caddy Tip - "Get a buggy!" My Caddy Tip - "Greens are hard and always steeply tilted. Train your putt speed in breaks." Need a buggy, as long distances from green to tee. Need a car, as hotel is quite isolated. My Caddy Tip - "Keep it left on the 18th." Great venue if all you want to do is play golf or if you have a car, as it is a bit isolated. The staff were very helpful and the food in the restaurant was great. All in all, a great golfing holiday. My Caddy Tip - "The greens are longer than you think." 5 star hotel and course at two star prices. My wife and I thoroughly enjoyed our short stay here. The course is quite long and challenging, and buggies are mandatory for starts before 11am. We used our own trolleys, but be warned, there is quite a walk from green to tee in a number of places where housing development is planned. We had booked bed and breakfast, but the hotel offers a set price buffet evening meal (3 courses and wine) which was excellent value. Montecastillo is quite remote, but well worth a visit. My Caddy Tip - "Get on the putting green before your round - remember you lose distance from elevated tees so don't overestimate your driving distance." All holes were interesting and a good challenge. Buggies are available but very expensive. However, at 70 years old and a lot of walking between greens to tees I would advise having one. My Caddy Tip - "Don't be afraid of using one more club as distances can be deceiving." Loved our holiday at Montecastillo and will return. Only downside is that the room we were given on the deal was not course facing so we paid a supplement. Wouldn't be the same if you couldn't enjoy the view. The 18th is spectacular and I enjoyed playing the 10th too. Hotel, food and staff excellent. My Caddy Tip - "Greens are quick and true. Keep your drives straight and you'll be ok. Keep left on the 16th to avoid large sand traps all along the right hand side of fairway, which also leaves a difficult shot into green." No favourite holes. Hotel good but try to go when the motor cycling is not on as it can get a bit noisy. The course was good, although a lot of remedial work was being done. The 18th hole was dramatic and challenging but in a beautiful setting. This was our golf groups favourite hole. The hotel gave good value for all inclusive and service was good. The only criticisms were the constant daytime noise from the nearby Jerez motor circuit and the view from the front of the hotel which was just an unfinished building site. My Caddy Tip - "Be conservative with shots, ambition got one into trouble." Many stand-out holes. Buggy a good idea for first round at least. Hotel dating but local. My Caddy Tip - "Just do your best. Plenty of room on most holes to give it a rap!" Holes 9 & 12 are great par 5s but on this course you need to accept what your handicap is. Do not try to smash the course because it won't happen. Play to your handicap and you will have a great game of golf. You can play well and get 18/19 points on front nine, then you come up against the back nine, which is certainly a challenge. My Caddy Tip - "Take an iron on 10." 18th is a great finishing hole. Hotel was excellent and the course was great, just make sure you book a buggy before you go. Hotel fine but there are too many non golfers on the course. Paid for unlimited golf but with rounds taking over 6 hours and no flexibility on tee times there's no chance of playing more than one round. The hotel was fine, all inclusive was good value and the food was a good version of buffet style catering. Very pleasant stay: golf course, hotel and weather were all great. Hotel is very top quality if a little remote; taxi or car to local restaurants. Golf course is top notch - tough but fair. Definitely worth playing. My Caddy Tip - "No need to always use your driver - pick your way around." Just love this course. Favourite hole has to be the 18th with an elevated tee giving superb views and the challenge of hitting the fairway! Coming off the green to the terrace for a cool glass of Sauvignon. Doesn't get any better. My Caddy Tip - "Hire a buggy." You need a buggy but they are quite expensive. Nice hotel, although a bit tired. 18th and 9th holes were beautiful. My Caddy Tip - "On the par 4's, use a driver." The hotel food and drink was cheaper than expected. You definetly need a buggy as there are long distances between holes. A fair test for all standards of golf. Not a bad hole on the course and was enjoyable to play the back 9 especially. However, the course does need a little TLC in places! My Caddy Tip - "Don't play shots that are not in your comfort zone or the course will bite you!" Every hole unique, especially par 3's. Hotel excellent with superb food and service. 18th was a glorious par 4. Hotel average, and no food after 2pm until 7pm. i.e. No lunch, so drinks only and limited choice. The hotel was excellent, but we were disappointed that there were no organised trips to anywhere. We paid for transport to Seville. Also, there weren't enough sun umbrellas at the pool and you couldn't get a drink at the pool either. Long course, hilly but walkable. Good hotel with spacious rooms, great breakfast and a busy bar, although, the drinks can be expensive for Spain. Easy reach with car for restaurants, etc. My Caddy Tip - "Hit it far & straight." Too many great holes to mention but the 12th was probably my favourite. My Caddy Tip - "Stay focused and this course will test you." Golf course and the 3 nine holes were all good. Use a local caddy. Great hotel which is being updated end of the year. Food outstanding, very friendly staff, plenty to do and only 2 mins from the beach. The whole party loved it and would go back again. My Caddy Tip - "Do not use a driver on every hole try and plan your way round the course." Everything was top class. Tough but playable golf, good accommodation (recently upgraded) and great ambience and food. My Caddy Tip - "Rent a buggy!" Fabulous course, venue and staff. I would definitely recommend and would go back. The course is well kept and challenging. The hotel has been recently upgraded. The staff are warm and friendly. The food is good to excellent depending on a la carts or buffet. The pool and spa are fab. My Caddy Tip - "Avoid the bunkers!" Challenging resort type course - good condition in Nov. Hotel was 3.5* in my opinion. Staff really friendly. Will return. My Caddy Tip - "Practice the bunkers - unusual base but needed as some are huge." 18th hole was brilliant. Long drive from Malaga but worth going if it is all inclusive. My Caddy Tip - "Play the holes as you see them." The 18th was the best hole for me, but a very challenging course, not for new starters in golf. The hotel is fantastic and the rooms are very comfortable. The all inclusive deal is very good value for money and there is a very good choice of food, from breakfast, lunch and dinner. The 18th was my favourite hole. The 18th hole is fabulous with an interesting elevated tee. 18th is a great hole though I didn't play it particularly well. It was a walkable course even though there were some long walks from greens to tees. We had a very good trip all in all. The weather the first 2 days was awesome but it was a bit chilly and windy thereafter...still great fun though! The hotel room was very nice, and had just been renovated. I believe they are renovating all the rooms so the resort is on the up. The restaurants and bar were well decorated with a nice friendly atmosphere and the food although basic, was plentiful and tasty. The golf course was great. Overall the greens, fairways and bunkers were all in great shape. The paths are starting to look slightly worn and battered but that happens with time I guess. It’s a little harder for the higher handicapper but still a great test of golf and very rewarding with some breathtaking views. The members of staff at the resort were friendly and helpful overall and the pro shop assistant was even happy to book other courses for us during our stay. YGT were top drawer. I was worried that booking through a travel agent would mean we suffer on comfort a little but not this time! We got a great deal too. We would definitely go back to Montecastillo Resort and always via YGT. I go away with yourgolftravel.com a few times a year and it’s hard to find a venue that offers better value for money than Montecastillo. We always keep an eye out for the unlimited golf packages and if you go at the right time of year, it’s an absolute steal. And let’s face it...in Spain there really isn’t a wrong time of year as it’s always sunny! The golf course here is good fun and in fairly good condition considering the amount of foot traffic it must get. The tee shot from the final tee is great fun, with the Wentworth-like hotel off in the distance, beckoning you to finish up and enjoy an ice cold beer! For a no frills golf trip where all you’re really looking for is lots of golf, a comfortable hotel and peaceful surroundings, Montecastillo really takes some beating, especially when you consider the price. Thoroughly recommended, as are yourgolftravel.com. Just got back from our Golf Holiday to Spain and the Montecastillo Resort...what a place! The course is no Valderrama but Jack Nicklaus has laid down a really enjoyable track all the same and we never tired of playing the course, even though we were taking full advantage of the Unlimited Golf that was part of our package. There’s a good variety of holes and the conditioning, while not 100% immaculate, was more than adequate. The greens in particular (the most important thing I’m sure most would agree) were quick and true with signs or foot traffic only appearing late in the evening. The only drawback was that play was a little slow. However we were on holiday and are aware that this is the case on the majority of resort courses...keep calm and carry on as they say! We certainly weren’t going to let the odd wait for a green to clear hamper our enjoyment that’s for sure! The hotel is excellent and ticks all the boxes for a group of golfers. Rooms were comfortable, food was decent and having a few beers in the evening after a long day on the course was perfectly satisfying for our group! The best thing about the trip? The value for money we got was quite unbelievable really...budget prices for fantastic quality AND quantity does it for me anyway! As ever YGT were excellent and we’ll be in touch soon to book our next break. 1. The hotel room was very nice and had just been renovated; perfectly adequate for a golfer’s requirements. 2. The restaurants and bar were comfortable and had a nice, friendly atmosphere. The food, although not haute cuisine, was plentiful and very tasty. 3. The golf course was fantastic. In general the greens, fairways, bunkers and tees were all in great shape. I’d say the course is a little harder for the higher handicapper but still a great test and very rewarding with some breathtaking views throughout. 4. The staff overall were friendly and helpful. The pro shop assistance even booked other courses for us during our stay because we felt like more, more and more golf! 6. YGT were top drawer throughout the booking process. I was worried that booking through a travel agent would mean we suffer on comfort a little but not this time and a great deal too. Good job YGT! We’ll be back in touch for next year’s golf holiday and with Montecastillo in mind, we’d certainly recommend it to other golfers. 3rd time of going as was a bit harder this time due to the windy conditions but as excellent as ever. This is a proper Championship golf course and not for the fainthearted or the high handicapper. It measures over 6,600yds off the yellow tees and every hole requires thought and accuracy.Lots of beautiful elevated tees to enjoy but hilly and long walks from green to tee means carrying a full bag is an option only for the young and very fit . We carried a half set for 9 holes on the first day and thereafter bought a 4 day buggy package at E35.70 per buggy per round .Overall it is a fantastic golf course for a mid handicapper. I am 64 years of age and 19 handicapper and 29 points was my best score of the week but loved the challenge. Lots of water so bring plenty of balls but it is well worth the effort and there is no issue about playing after 12 noon and enjoying free golf !! The course in general was fair with very fast greens especially if you got the wrong side of the hole. Play was a little slow but that's usual on these type of resort courses. Overall very enjoyable. Majority of the course was in great condition.Certain areas of the buggy carts are in dire need of repair and could be classed as mildly dangerous. Thought i was driving on UK potholed roads!!!. However the weather, company on the course and the setting will take me back. Lovely course, unfortunately there was a large competition when we were there, they had block bookings coinciding with our times so we were moved and were then very slow. It was apparently sprung on the hotel by the competition organisers, we were told, but it did overshadow an otherwise superb experience. Hopefully next time this will not happen. The other issue was the buggies, quite old and doddery, as well as expensive, we were told new ones are on order for january but they do need updating. Enjoyed the golf with some really interesting holes and a variety of challenges ranging from relatively straight forward to hard. Golf was not charged and was an “add on” but the cost of buggies made the deal less of a bargain. We mistakenly thought we had buggies included and then had to pay €48 per buggy (people who played before midday were €78). We felt a bit conned because of this expectation. Although the rounds were slow - 4.5hours for a two ball in a buggy, you accept it as 'holiday golf'. We did get paired up after 9 holes with another 2 ball, which was fine. We thought the buggies were expensive - €48 per buggy per day, but you need one as the distances from green to tee were a long way.